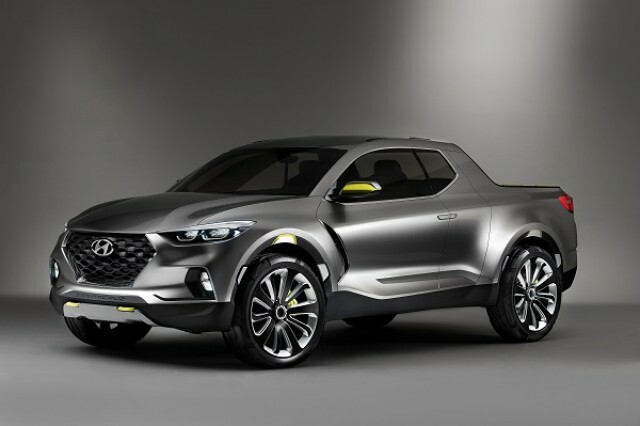 It kicked off 2015 with a buzz-generating surprise debut at the North American International Auto Show in January, and now the popular Hyundai Santa Cruz has earned the prestigious title of Concept Truck of the Year at the 14th annual North American Concept Vehicle of the Year (NACVOTY) Awards at the Concours d’Elegance of America at St. John’s. The Santa Cruz was recognized as the Concept Truck of the Year for its design, style, materials, technology, market visibility and market responsiveness – besting the Kia Trail’Ster and Mitsubishi GC-PHEV. The award was presented by Mark Phelan, auto critic at the Detroit Free Press and NACVOTY juror. The NACVOTY awards recognize those vehicles most likely to shape the future of the automobile industry. More than two dozen jurors participated in a selection process that involved a total of 30 vehicles, each introduced to North America during this season’s auto shows in Los Angeles, Detroit, Chicago, Toronto and New York. “The Santa Cruz is what the light-truck category needs – loads of style for people without big loads,” said Gary Vasilash, Automotive Design and Production editor-in-chief and NACVOTY juror. The innovative Hyundai Santa Cruz crossover truck concept reflects a completely new interpretation of truck utility for a new generation of buyers. 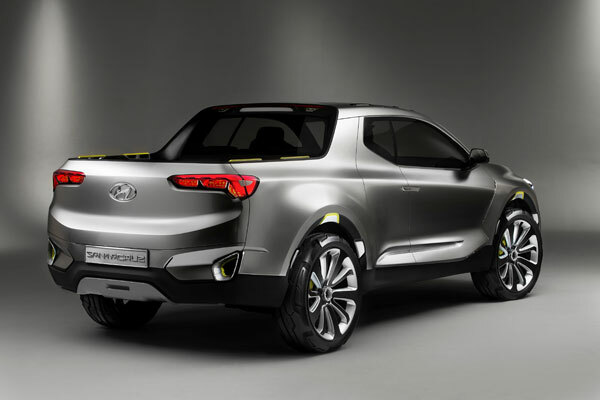 The Santa Cruz concept meets the unspoken needs of a growing millennial lifestyle that Hyundai calls “urban adventurers.” This new crossover provides urban adventurers the expandable utility they need throughout their active week – from work-life professionalism to social interests to a variety of outdoor pursuits –without the typical compromises they have come to expect from the industry’s current product offerings. The Santa Cruz concept is purposely compact, and although it features four doors and seating for five, its overall footprint is similar to that of a small CUV. MAN celebrated the 60th anniversary of its Munich plant by holding a big family open day for its employees and their families on Saturday 25 July 2015. Approximately 30,000 guests graced the huge event. The anniversary also saw a parade of historic trucks which went on for a few hours. 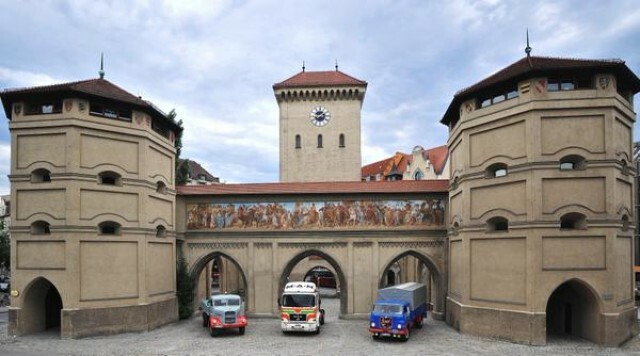 According to MAN, the vintage vehicles are testament to the years of the economic miracle in Germany and the early days of long-haul transportation. The oldest truck, a MAN 620 L1 tipper, dates back to 1957 and boasts an 120 hp, 8.3 litre engine – impressive for the time. It was joined by the 115 hp MAN 415 F, known as the ‘Pausbacke’ [chubby cheeks], from 1968, which is a nostalgic reminder of long-haul transportation from days gone by. Another impressive sight will be the cement silo semitrailer combination from 1960, featuring a MAN 750 towing vehicle and boasting 145 hp. And finally, the MAN 19.361 cab over engine with 360 hp and 12 litre engine will showcase the latest in low fuel consumption standards from 1985. BYD has delivered yet another 10 units of its buses to the Campinas City Administration in Brazil, earlier this month. Campinas is a city in the interior of the state of São Paulo, Brazil, and will be the first in the country to have a fleet of fully electric, zero emission buses operating in its streets. 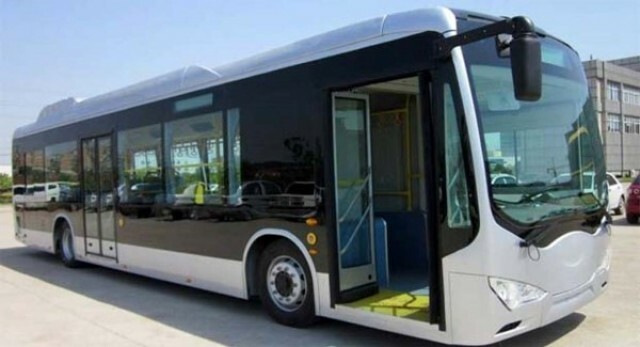 The model chosen to integrate the fleet in Campinas is the BYD K9, a 12-meter, 4-door, low-floor urban bus, with universal accessibility for passengers with limited mobility. Its innovative design was especially suited to the Brazilian market, and features optimized power performance as compared to its diesel counterpart. The BYD K11 articulated electric bus – which features the longest driving range in the world in the category – had also been demoed to the Mayor, and will soon begin testing in the city. 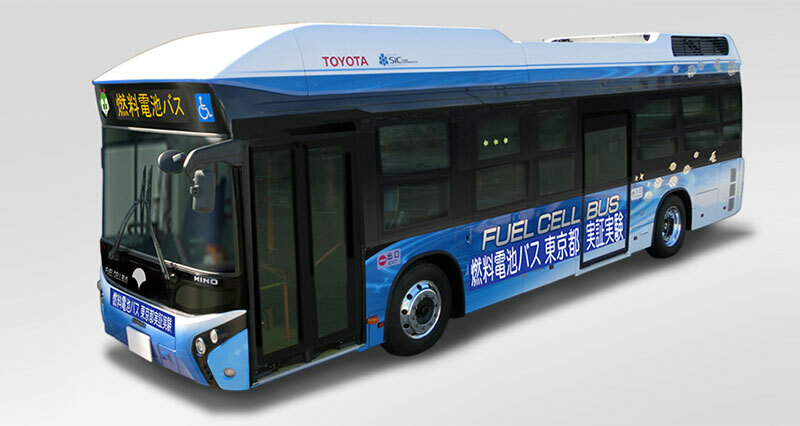 The fuel cell bus was developed jointly by Toyota and Hino based on a Hino hybrid non-step bus and is equipped with the Toyota Fuel Cell System developed for the Mirai. The system generates electricity from the chemical reaction between hydrogen stored in the onboard fuel cell system and airborne oxygen. The design of the bus has been optimized for increased power output, and features two fuel cell stacks and motors alongside eight high-pressure hydrogen tanks. Toyota was responsible for development of the Toyota Fuel Cell System, while Hino handled development of the bus body, including the chassis. 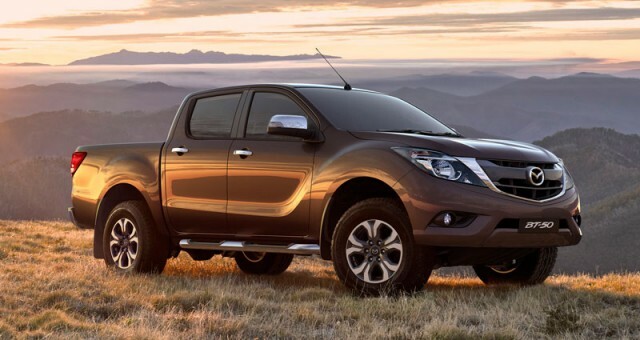 Mazda Motor Corporation has announced that production of the freshened Mazda BT-50 pickup truck began yesterday at the company’s manufacturing plant in Thailand. The company said that it plans to start introducing the freshened model from the second half of 2015, starting with Thailand and Australia. In case you’re wondering what’s new, the new BT-50 features newly designed front face, rear combination lamps and aluminum wheels. In addition, the interior has also been refined to give a higher-quality feel. For the first time, the model features a rear-view camera as safety equipment to support safe driving with peace of mind. The powertrain and body-type line-up is unchanged from the previous model. Scania’s market share in Europe reached a record high 17.2 percent during the first half of 2015. The increase was connected to the early and very successful introduction of the Euro 6 range and sales activities in new segments, among other things. 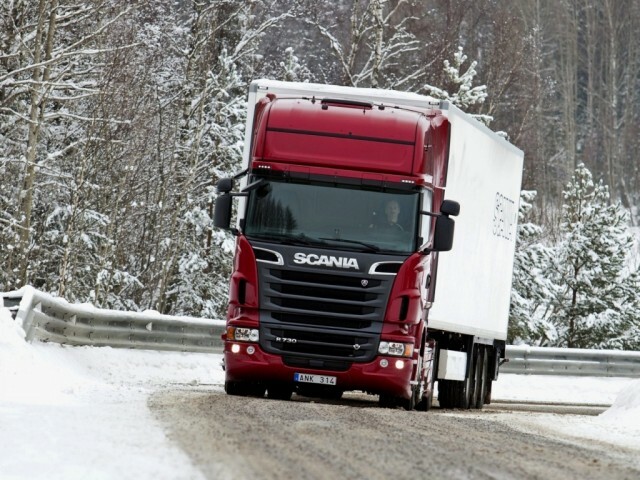 Scania increased its market share in the European truck market to 17.2 percent during the period January to June 2015. This can be compared to 15.3 percent during the same period of 2014. The positive trend which began last year with the transition to the Euro 6 emission standard thus continued. “The feedback from our customers shows that we have really met the high expectations placed on our Euro 6 engine range and that demand in our major European markets is good,” says Scania’s President and CEO Per Hallberg. The second and third generation Euro 6 engines from Scania have proved to perform very well at customers and in trade press tests. Increased sales activities in new segments have also contributed to the record high market share in Europe. Order bookings in Europe increased by 41 percent to 13,270 (9,410) Scania trucks, compared to the second quarter of 2014. Meanwhile, demand continues to be weak in Brazil and in Russia. “In Brazil, order bookings were impacted by the low economic activity and less favourable conditions for truck purchase subsidies. Russia was also affected by low activity,” explains Hallberg. Order bookings in Latin America decreased by 34 percent to 2,611 (3,960) units during the second quarter compared to the same period of 2014. Eurasia, where Russia is the main market, order bookings decreased by 4 percent to 731 (760) units. Scania’s total order bookings amounted to 19,823 (20,987) trucks during the second quarter of 2015. Tata Motors has bagged an order to supply around 1,200 vehicles of its high-mobility 6X6 multi-axle trucks, from the Indian Army – the single largest order awarded to an Indian private original equipment manufacturers (OEM) in land systems under the DPP by the Indian army. The order for 6X6 vehicles is for ‘material handling cranes’ for the loading-unloading and transportation of ammunition pallets, spares and other operational equipment. 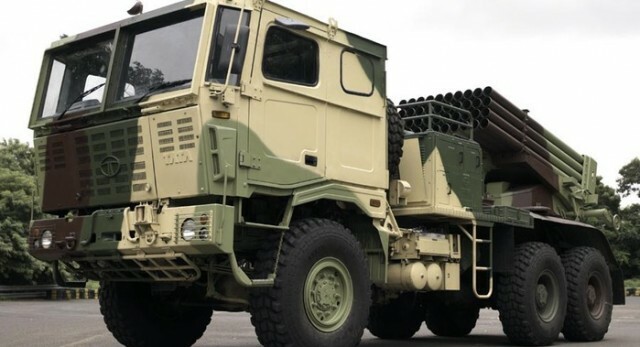 Developed indigenously, the Tata 6X6 high mobility all-terrain all-wheel drive vehicle has completed a total trial duration of 25 months, demonstrating maximum performance in the most demanding conditions. Designed to cope with extreme on or off-road loads, these vehicle have gone through trials like water-fording, on cross country terrains and plains and at Vehicle Research & Development Establishment’s (VRDE) torture track. The Tata 6X6 is designed for easy operability. The vehicle is easy to maintain, due to accessibility to its aggregates. The vehicle is fitted with central tire inflation system (CTIS) for mobility in soft sand desert conditions. The CTIS allows the driver to adjust the tyre pressure from his seat. The system provides the vehicle with better traction on different types of surfaces, especially when carrying vital and heavy loads. The self-recovery winch assists in extraction of the vehicle (including other vehicles in the convoy) during operations. The vehicles cabin is modular with HVAC (heating, ventilation, and air conditioning) and is fully-ready for up-armouring. High ground clearance enables better negotiation of gradients, sand dunes, off-road terrains, trenches with higher water and mud fording capabilities, whilst carrying designated military payloads. The vehicle is also capable of achieving sustained speeds of 40 kmph, on severe cross country terrains. Vernon Noronha, vice president, Defence and Government Business, Tata Motors said, “We at Tata Motors are extremely proud to have bagged the single largest order, among Indian OEM’s from the Indian army, for the most technologically advanced high mobility load carrier system ever built here in India. The order is a validation of our strategy and growth potential, for our durable and extensive range of defence vehicles, designed and developed with our evolving customers, including that of security forces across the world. As leading suppliers of mobility solutions to the country’s security forces, we will shortly commence delivery of these high-mobility vehicles”. Lego Group and Daimler AG have collaborated once again and revealed the Mercedes-Benz Arocs 3245 scale model. “After the very successful cooperation with LEGO Technic on the Unimog-project, Mercedes-Benz Trucks subsequently considered a follow-up project,” says Andreas Gruber, Marketing Manager at Mercedes-Benz Trucks. “In the context of the new Mercedes-Benz Trucks product launches – starting in 2011 – one specific vehicle seemed to have a special potential for a new joint LEGO Technic/Mercedes-Benz Trucks project: the new Arocs 3245,” says Gruber. With its 2,793 elements, Power Functions, and several of the new LEGO pneumatic actuators, it will be one of the most complex models in the LEGO Technic assortment. The Truck will measure 12” (31 cm) in height, 5” (14 cm) width and 21” (54cm) length. To make sure designers replicate as many details as possible on the Arocs 3245, Horsted and his team visited the Mercedes-Benz Trucks production facilities in Wörth to take a closer look at the assembly line. For Andreas Gruber and his team at Mercedes-Benz Trucks it was also important to get the LEGO designers as close to the real Arocs as possible. 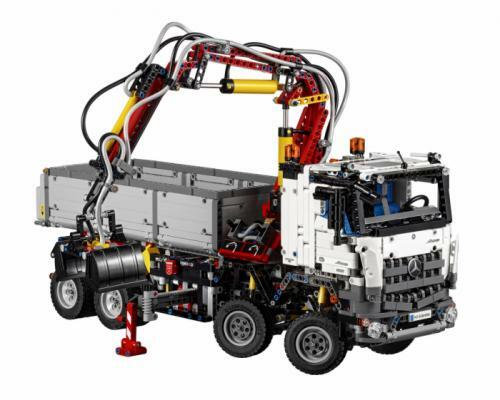 The LEGO Technic Mercedes-Benz Arocs 3245 will be available from all good toy retailers from 1st August 2015. Scania has delivered 36 gas-powered buses to passenger transport company Nobina in Norway. This marks a Scania break-through for gas buses in Norway. Norway is the newest market to which Scania delivers gas buses. Recently, public transport companies in Colombia and Indonesia have also taken deliveries of Scania gas buses. The new Scania OmniExpress 3.20 LE Euro 6 buses are replacing older buses operating in the Ski area, southeast of Oslo. The buses can be fuelled with compressed natural gas, CNG and biogas which all contribute to lower emissions of greenhouse gases and noise. Nobina is the largest bus transport company in the Nordic region. 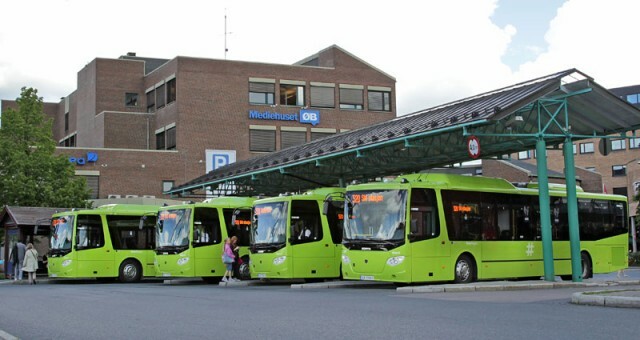 The company has 7,000 employees and operates 4,000 buses in Denmark, Finland, Norway and Sweden. 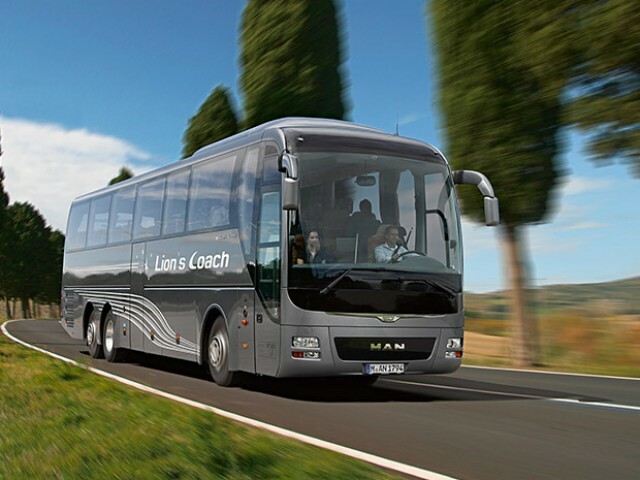 MAN has released a ’100 Years Edition’ of the MAN Lion’s Coach to mark the product’s anniversary. The vehicle is now available in a limited run of 100 units. The Lion’s Coach is a high-deck touring coach and a true all-rounder on the road, providing value for operators and comfort for passengers. The ’100 Years Edition’, which is being marketed throughout Europe, represents a real showpiece, designed to appeal primarily to customers with a love of the product. The MAN Lion’s Coach EfficientLine is equipped with a 440 hp D26 engine and the MAN TipMatic gearbox. The package also satisfies many customer requirements thanks to the GPS-assisted EfficientCruise cruise control, as well as other assistance systems such as EBA and LDWS. Specially designed upholstery featuring the MAN lion and Texas grey metallic paint further enhance the model. The anniversary ’100 Years Edition’ of the MAN Lion’s Coach will be presented to the public at the Busworld 2015 trade fair in October. The special edition will be available to customers, configured with its own basic equipment and selected optional extras, until 31 December 2015.